Heat oven to 350°F. Place large cookie sheet on middle oven rack. Unroll pie crust; place in ungreased 10-inch tart pan with removable bottom. Press crust firmly against bottom and side of pan; trim edges. In large bowl, beat 1/4 cup melted butter, brown sugar and corn syrup with electric mixer on medium speed until blended; beat in eggs until blended. Add flour, cinnamon, baking soda and salt; beat on low speed until blended. Stir in carrots, raisins and chopped pecans. Spread mixture evenly over bottom of crust-lined pan. Place tart on cookie sheet in oven. Bake 30 to 40 minutes or until filling is set and deep golden brown. Cool completely on cooling rack, about 1 hour. Remove side of pan; place tart on serving plate. In medium bowl, beat cream cheese and 2 tablespoons butter with electric mixer on high speed until smooth. Add powdered sugar and vanilla; beat on low speed until creamy. Frost cooled tart. Place praline pecans evenly around edge of tart. Refrigerate 1 hour. To serve, cut into 12 wedges. 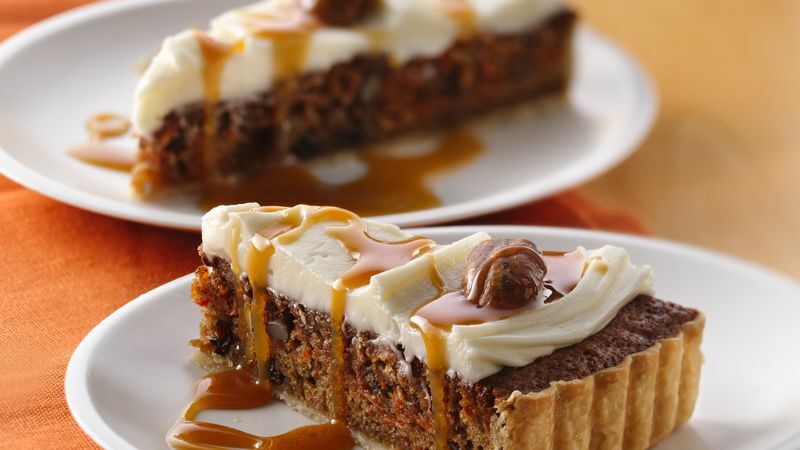 Drizzle each serving with 2 teaspoons caramel syrup; garnish each with carrot curl. Store covered in refrigerator. *To make carrot curls, cut thin strips of peeled, medium-size carrots with a vegetable peeler. Roll each strip and fasten with a toothpick. Chill in ice water 2 to 3 hours. Remove toothpicks before garnishing.